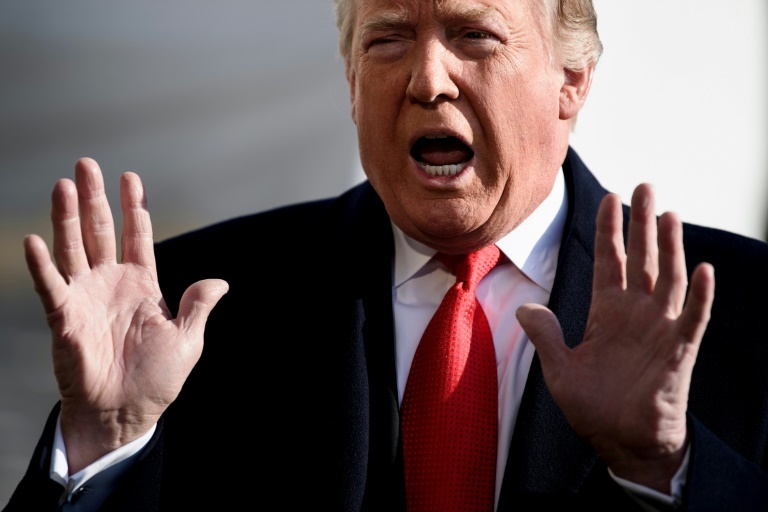 US President Donald Trump on Saturday blamed opposition Democrats for the death of two immigrant children in US custody, comments set to heighten tensions as the second week of a government shutdown began over his demands for a wall on the US-Mexico border. “Any deaths of children or others at the Border are strictly the fault of the Democrats and their pathetic immigration policies that allow people to make the long trek thinking they can enter our country illegally. They can’t. If we had a Wall, they wouldn’t even try!,” Trump said on Twitter. The tweet hardened Trump’s tone after an earlier message on Twitter that said the next move in the eight-day budget standoff over border wall funding belonged to the Democrats. “I am in the White House waiting for the Democrats to come on over and make a deal on Border Security,” Trump tweeted. But members of Congress, most of them home for the holidays, kept low profiles, and there were no evident signs of any imminent breakthrough. Others called the Trump tweets “disturbing” and pointed out that US immigration policies have been in place for years without children dying in government custody. Homeland Security Secretary Kirstjen Nielsen was in Yuma, Arizona, on a trip to witness border operations first hand after saying last week that the US will take “extraordinary” protective measures to deal with a surge of immigrant children in custody. He died on the same day that Jakelin Caal, a Guatemalan girl who died in US custody under similar circumstances earlier this month, was buried back in her home village. In the last two months, US Border Patrol agents have apprehended 139,817 people on the southwest border, compared with 74,946 during the same period a year earlier, Nielsen said. When the shutdown began on December 22, affecting a quarter of the federal government, Trump canceled his plans to spend the year-end holidays in Florida and vowed to remain at the White House — though he made a quick, unannounced trip to visit US troops in Iraq. But as he tries to build pressure on Democrats to help fund the border wall he sees as an urgent priority — threatening even to close the border if no deal is reached — Democrats appear adamant in their refusal to pay for a project they view as a waste of money. Some conservative Republicans, meanwhile, appear equally determined to press for the wall. Trump has demanded $5 billion for wall construction — though the White House reportedly has shown flexibility on that number — while Democrats have offered to spend no more than $1.3 billion for security measures not including a wall. Nancy Pelosi, who is expected to be House speaker in the new Congress, has vowed to “swiftly” reopen the government once her Democrats take control of that chamber from the Republicans on Thursday. Trump had previously blamed Democrats for policies he said had forced his administration to separate some children from their parents at the border, a claim widely seen as specious. The effects of the shutdown have been slow to appear — many of the 800,000 government employees sent home or working without pay would have been off for the holidays anyway — but once the New Year arrives, pressure will grow. The popular Smithsonian museums and National Zoo in Washington, for example, said they found money to stay open through New Year’s Day but will close on January 2 if the standoff continues. This is the third government shutdown of the year, following shorter closures in January and February. Shutdowns have rarely been popular with the public. A recent NPR/PBS NewsHour/Marist poll found that Americans — by 57 to 36 percent — favored Trump seeking compromise rather than insisting on his wall demand.